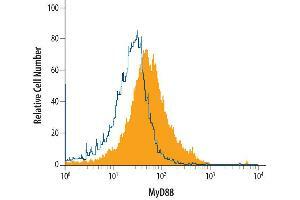 MyD88 in RAW 264.7 Mouse Cell Line. 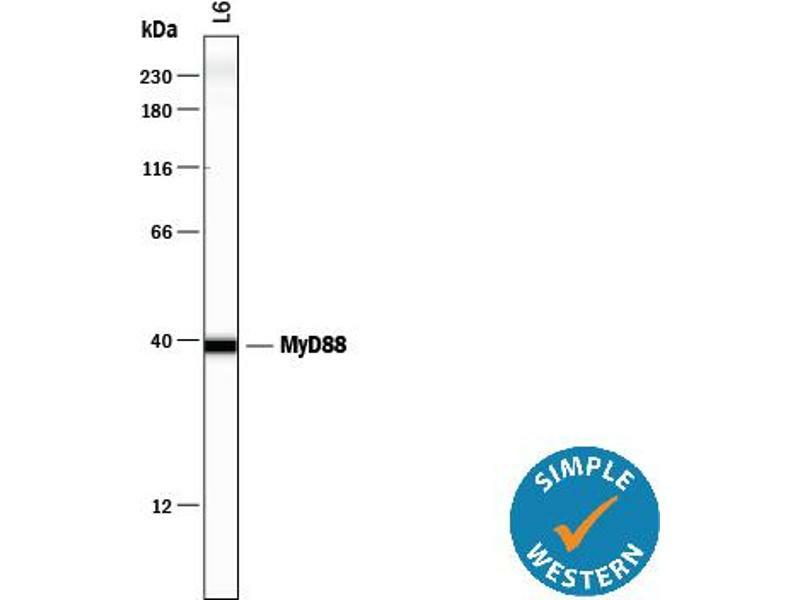 MyD88 was detected in immersion fixed RAW 264.7 mouse monocyte/macrophage cell line using Goat Anti-Mouse/Rat MyD88 Antigen Affinity-purified Polyclonal Antibody. 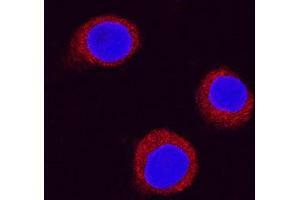 Specific staining was localized to cytoplasmic. 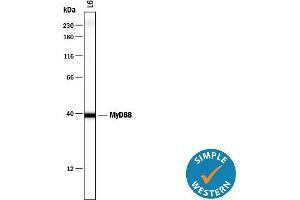 Specificity Detects mouse and rat MyD88 in Western blots. Reconstitution Reconstitute at 0.2 mg/mL in sterile PBS. Buffer Lyophilized from a 0.2 μm filtered solution in PBS with Trehalose. Storage Comment Use a manual defrost freezer and avoid repeated freeze-thaw cycles. 12 months from date of receipt,-20°C to -70°C as supplied. 1 month,2°C to 8°C under sterile conditions after reconstitution. 6 months,-20°C to -70°C under sterile conditions after reconstitution. Javmen, Szmacinski, Lakowicz, Toshchakov: "Blocking TIR Domain Interactions in TLR9 Signaling." in: Journal of immunology (Baltimore, Md. : 1950), Vol. 201, Issue 3, pp. 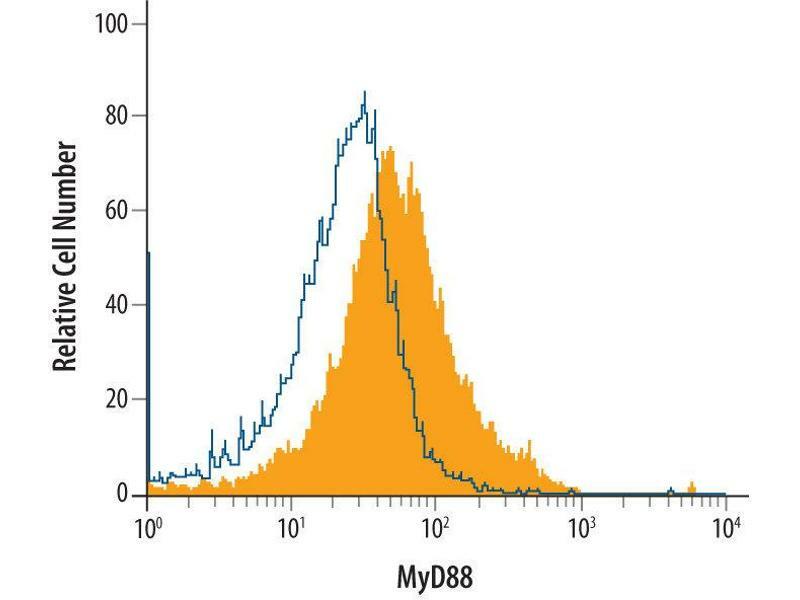 995-1006, 2018 Method employed by authors: Immunoprecipitation (IP) (Sample species: Mouse (Murine)). De Nardo, Balka, Cardona Gloria, Rao, Latz, Masters: "Interleukin-1 receptor-associated kinase 4 (IRAK4) plays a dual role in myddosome formation and Toll-like receptor signaling." in: The Journal of biological chemistry, Vol. 293, Issue 39, pp. 15195-15207, 2018 Method employed by authors: Western Blotting (WB) (Sample species: Mouse (Murine)). 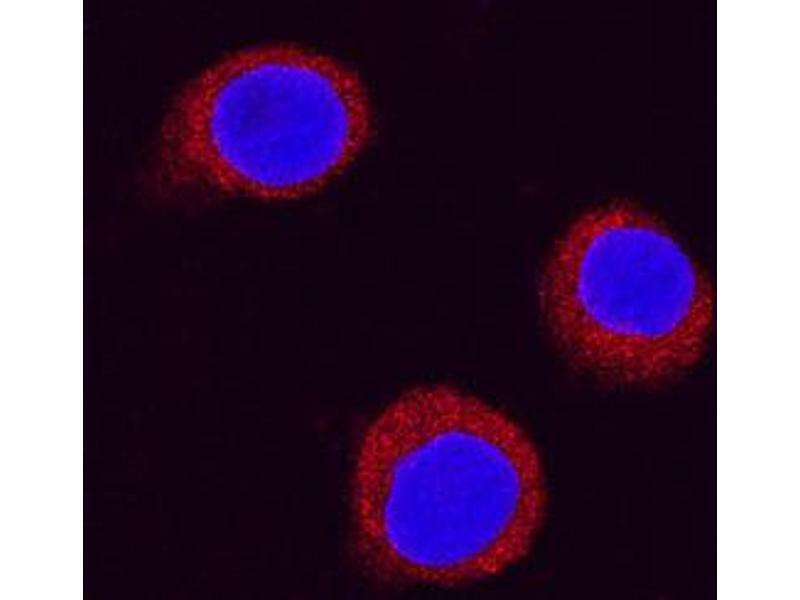 Schenten, Nish, Yu, Yan, Lee, Brodsky, Pasman, Yordy, Wunderlich, Brüning, Zhao, Medzhitov: "Signaling through the adaptor molecule MyD88 in CD4+ T cells is required to overcome suppression by regulatory T cells." in: Immunity, Vol. 40, Issue 1, pp. 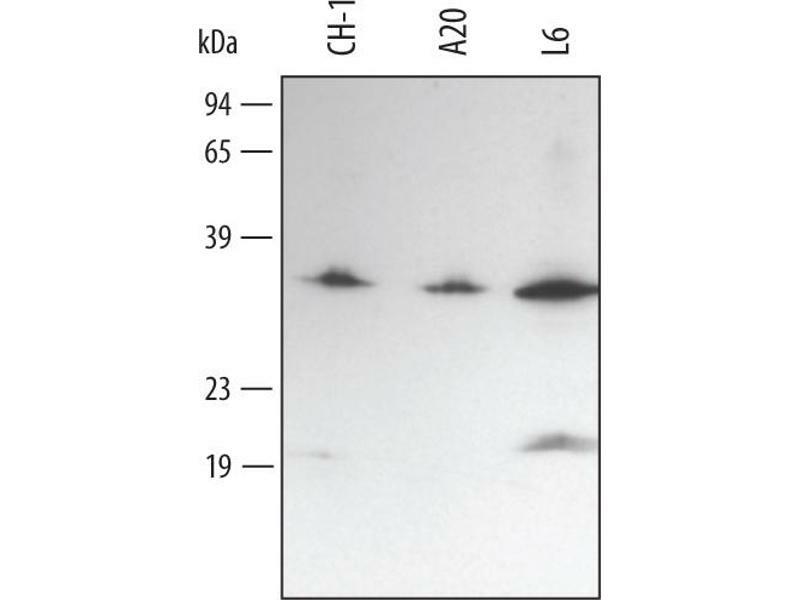 78-90, 2014 Method employed by authors: Western Blotting (WB), Western Blotting (WB) (Sample species: Mouse (Murine)). Cole, Shirey, Barry, Santiago, Rallabhandi, Elkins, Puche, Michalek, Vogel: "Toll-like receptor 2-mediated signaling requirements for Francisella tularensis live vaccine strain infection of murine macrophages." in: Infection and immunity, Vol. 75, Issue 8, pp. 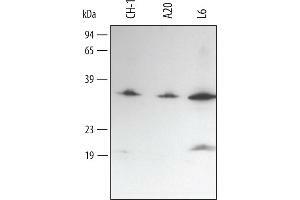 4127-37, 2007 Method employed by authors: Immunocytochemistry (ICC), Immunocytochemistry (ICC), Immunocytochemistry (ICC) (Sample species: Mouse (Murine)).